Level-5 is using the Professor Layton license for a social game. Even the venerable Professor Layton cannot escape the gravitational pull of the social game. Level-5 has announced that it's teaming up with Japanese social game developer DeNA to develop a Professor Layton social title called Professor Layton Royale. No, it doesn't come with cheese. Professor Layton Royale is an extension of DeNA's Royale series which is very popular on smartphones in Japan. The Professor Layton version will also play out on mobile platforms and task players to catch criminals, or become them and evade amateur lawmen with huge hats. 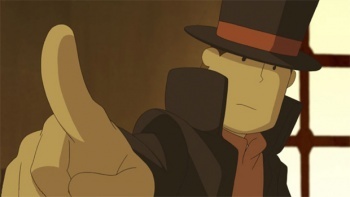 Players are assigned one of three roles from the Professor Layton series: detective, criminal, or citizen. Detectives and citizens work together to figure out who's the criminal. The criminal can put up obstacles to avoid being caught within a certain time limit. Level-5 boss Akihiro Hino says it's a "test of deduction and tactics between players." It doesn't appear to bring over any of the brain teaser-based gameplay from the DS/3DS versions of Professor Layton. Professor Layton Royale is another example of the Professor branching out, as he's also lending his talents to a Phoenix Wright crossover title. Sadly, just like the Phoenix Wright crossover, Professor Layton Royale will likely remain in Japan. We never seem to get the cool stuff overseas.